Partially true, Stan, but remember Poser changed between Carrara versions (even older Poser stuff had problems) so with no new SDK, Transposer 2 did not work with Carrara 6. The folks who owned Poser then were just as much if not even more or all responsible for that. But Howie is working on another great scene, an Alpine one, where the clouds look good, too. Maybe there's hope! Hope for what? Another premade scene to buy rather then better instructions and features? Don't get me wrong, I love Howie's scenes, they are awesome. But buying them doesn't teach me how to make them. It doesn't come with instruction on how they are made. And certainly doesn't come with better atmospheric tools. Howie, dude, your stuff is truly awesome it's nice to see someone supporting carrara in such away. Please don't stop. The thing is if you had and worked with poser 6, transposer worked great. Why take it away from those that were using it and had no intention of upgrading poser; in favor of upgrading carrara. DAZ took a tool away from me that worked quite well, was part of my work flow, and I was really enjoying using. No, hope for more sales is what I see. Every time Howie has a new incredible scene, people want it and the only way they can use it is to buy Carrara. We already have seen new users here because of that and people wanting to use his scenes in DAZ Studio, which they can't. Each purchase helps keep Carrara alive. How many times do I have to say it to make it clear?! I still have all the older Carrara and Poser stuff on an old computer. Unfortunately I don't have the old Poser 6 discs handy (and the ones before that) for an upgrade install. That lack of Transposer slowed me down in what I wanted to do, too, but I've always blamed the Poser company owners at the time for that. No, hope for more sales is what I see. Every time Howie has a new incredible scene, people want it and the only way they can use it is to buy Carrara. Seeing Howie's work was indeed a big factor in my own purchase decision for Carrara. I just wanted furry pussycats!! Seeing Wendy's work influenced me to buy C8Pro. How much time do each of spend actually working with Carrara every day? seriously, about my 5th post on the old forum was asking about Carrara fur, my first ever Daz animation was the millenium cat talking!! varies, it I start up my computer, I HAVE to open Carrara! I actually have days I do not start the computer, always on my damned Android though!! Not as much time as I'd like. It does vary and some days I never get time to take a good crack at it. If I get in deep about two hours but many days only 15 minutes to half an hour. Just because a company did something a long time ago doesn't mean they can't change course afterwards and do something different. The economy changes, and it sure did in recent years. Management changes, or might change its mind. Customers change. Buying habits change. What is cool changes. When I was a kid, someone invented the skateboard. And damn, they were cool. Cool kids rode skateboards and did tricks on them. Then, years later, everyone decided skateboard were for dorks. Nobody rode them. Holy cow. Wish I had invested in a skateboard company when I was a kid. A few years ago, Blender didn't exist in its present form. And years before that, nobody gave away free software because it was a stupid idea. Life changes. What's important is today and tomorrow. DAZ has to decide what to do with Carrara. Personally, I think DAZ is so giddy with their success in getting new content buyers after the free giveaway that Carrara is pretty much a pain in their side right now. They have to decide if many, or any, of those new, potential customers are more than just a "hit-and-run, grab the free stuff and move on" type of customer. Personally, my guess is that the vast, vast majority of those "new customers" are here today, gone tomorrow, and have no interest whatsoever in spending any serious amount of money on Carrara. Especially when they already got a bunch of new software that does the same thing (in their eyes, at least). Most will think that the software and content is cool for a while, but let's face it, most of this stuff is WAY too complicated for the average kid, especially in an age of instant gratification with video games and everything else they have at their fingertips. Having to figure out UV mapping is probably worse than having to get up a 6am to go to school on Monday. Heck, even most 'serious' hobbyists are in it just to drag and drop stuff in their scenes for fun, and anything else is too much work. Multiply that by 10 and you have the typical 3d kid who downloaded all that cool free software. I really can't see where Carrara's market lies in the future. And honestly I don't see a real market for it. When there's free software that does the really cool stuff much better (Blender), and free stuff that does essentially the same thing (DAZ Studio and Hex and Bryce), and few people know about it in the first place, and the time and investment it would take to make Carrara a player in the market is virtually impossible, and all of this complicated 3D software is just way too difficult, and did you see that awesome video of a flamethrower done in Blender??? Yeah, I know...I'm mean and cruel and blah, blah, blah...but if anyone has a rational reason why I'm wrong I'd love to hear it. That is where we differ. I bought carrara to get away from the limitations of freeware apps. I had no interest in poser or DAZ content till after DAZ bought it; even though I could have been using it before. I love to set the stage, build the scene, set the lights, next scene. I usually lose interest in a scene long before the final render. So buying a preset scene is of no interest to me, except to revere engineer it. Even in a stonemason scene, I will spend far more time resetting shaders, making lights, making various masks and stencils to peak up some shader, then I will actually rendering it. But then I would be just as happy if it was just a set .objs with uvmaps. In fact a good 1/3 of the content I use is just that. That is one of the things I love about carrara, you're not really too limited as to what format the content you use, is in. Giving away your software isn't a new idea . Paint shop Pro was originally Given away of the cover of PC magazines... On a 3.5" Floppy disk. it was a much less developed program at that point,. Both products were purchased by bigger companies,... Both products now retail for a price. Those were not unique cases,. I was a working adult when skateboards appeared, and they weren't new,. or even a new idea, but they were marginally better than a slab of scrap wood, or a large book (the Broons or Oor Wullie Annual) sitting precariously on top of a roller skate. which you would sit on , and roll downhill, usually crashing in a heap halfway down. Skateboards were the next Hoola hoop,. the next fad, and like many products, they disappear but emerge as "Retro", given enough time, and a manufacturer eager to cash in. History is always repeating itself,..
By offering a product cheaply or free, you attract new customers. Some will play with it, and give it up,. some will love it and become your customers for life. the Romans knew this, and would give FREE bread, with every basket of fish, simply to move the product,.. quickly.! if your product improves, then you'll gain more customers. If it doesn't they'll go elsewhere. ....to avoid the fishy smell,. It's not a case of , we don't have the development resources, so we'll just sit back and watch our customers walking away. if you want people to buy what you sell,.. you need to constantly make it attractive to them. Greedy wealthy industrialists caused the first stock exchange crashes, and greedy wealthy bankers collapsed the western economy. and that lead to global meltdown. History is always repeating itself. The longer you're around, the more you'll see that. as you say,. Things change,.. but some things remain constant. Customers change. Buying habits change. but,.. You're parents bought a car, and so will you, and so will your children. There's no guarantee that somewhere down the line Blender won't start charging, or won't disappear. or be bought by a BIG company. or that Daz won't release an I phone app that will earn it a bucket load of cash.,.. selling content, .created by users,.. for users. while taking a cut for retailing it. That's always been Daz3D's core business,. Not developing software,. or marketing software. that's a recent addition. but the core business model remains the same. Having your OWN software product, frees you, as a company, from any reliance on another company's development strategy. and Carrara , Studio, Bryce and hexagon are all part of that overall strategy. enabling more users to become creators and sellers of content, as well as remaining buyers of content. One sales strategy which is tested and proven,... is to give some of your product ,.. (or an offer of a discount) ..inside a magazine. This promotes your software,. gives you advertising / editorial space,. ..while providing a purchasing incentive for the magazine buyer. Both the software seller, and magazine seller,.. benefit from that arrangement. I don't agree with this,.. I don't think your deliberately being mean and cruel,. after all, ...what's the point in that. ? I think that sometimes,. you're assuming you know something,.. perhaps wrongly,. or just misunderstanding what someone meant. Those are things we all do from time to time. but,.. it's about how the individual reacts to someone who is obviously feeling attacked by what they wrote. do they continue the attack or do they stop and think about what's going on. there's a difference between a debate, and an argument. "...Heck, maybe there really is a Ninja-assassin team of software commandos hard at work at Draper..."
DAZ3D is no longer in a nice spiffy looking building in Draper, they moved to an old building on Salt Lake City. Also not a good sign. Hopefully I'm reading it wrong, but their address shows a suite on the second floor, which does not suggest a purchase of the entire building. Andy, do you have a POINT to make, or do you just say stuff? And do you understand what an ANALOGY is? Okay, if you don't like my analogy about skateboards, or about giving software away, and want to pick apart the specifics about how accurate it is, then fine. No analogy is perfect. BUT THAT'S NOT THE PURPOSE OF AN ANALOGY!!! It's to provide a simple, graphic example to make it easier for people to understand. Do you get that? You spend 25 paragraphs addressing the minute details about how accurate my analogy is, and list all the exceptions, but miss the general point I'm making. You seem to just want to say stuff that's "right-er" than the next guy, but have nothing to say that makes any sense about the main point we're discussing. I gave you many rational reasons about my view of Carrara's future, and you're response was solely to give exceptions to my analogies. What is YOUR rational view of Carrara's future, backed by any kind of rational argument? I gave you many rational reasons about my view of Carrara's future, and you're response was solely to give exceptions to my analogies. It could just be me, but I think that IS his point. His exceptions to your analogy are themselves an anology. Everything has an exception, including your view of where Carrara is headed. But, that's just my interpretation of it, I've been wrong before. but if anyone has a rational reason why I’m wrong I’d love to hear it. I can't help but think that a lot of this is coming at things from the wrong angle. Carrara has the potential to be the most versatile 3D suite on the market due to its ease of use with DAZ/Poser content. None of the "big league" 3D programs have that, and it's an attractive thing to a lot of people. I know it takes time and money to update software, but as Plautus said, "You must spend money to make money." I think DAZ is foolish for not making Carrara into what it could be and advertising the hell out of it mags like 3D World and such. Its always frustrating when we discuss Daz and Carrara . It seems Daz is trying to get what they want into a next version and not so sure its everything anyone else wants but that's just the way it is. You can wish, hope , beg for something more cool or improved but in the end ----we will get what Daz thinks make them the most money. They might be wrong but its their dime. And then despite it all ----we all know its still a really cool 3d application that can do alot ----and do it fast. We just all have some of our favorite spots that could use improvement that are unlikely to get addressed anytime soon and it makes you want to whine. That's one of the sanest looks at the issue I've seen. Kodiak is pretty much spot-on too -- Carrara could be a force for good in this world even if we never see a Hollywood blockbuster that uses it. A little more advertising a development polish is all it needs. 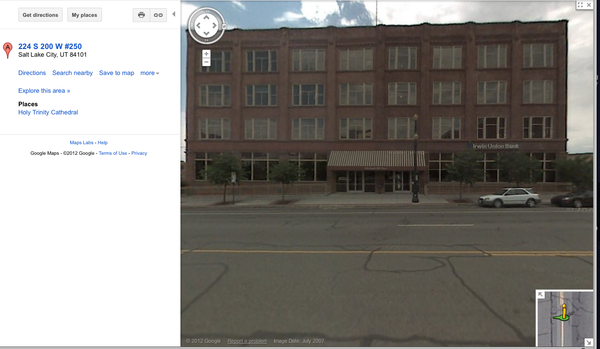 DAZ3D is no longer in a nice spiffy looking building in Draper, they moved to an old building on Salt Lake City. Also not a good sign. But you're right, the new address is "224 South 200 West #250, Salt Lake City, UT 84101 USA"
Could some kind person do us a favor and fire up Google Maps or Google Earth and do a street view of the building and post it so we can see what the new place looks like? I tried, but my internet is slower than molasses in January on the North Pole during an ice storm after the molasses has been sitting outside all night long. My simple, basic point was this: "Markets and tastes change". And what DAZ did before, years ago, may no longer apply because conditions change. Nobody in their right mind could argue that's not true. It IS generally true. And my analogies were merely simplifying examples towards that point. Whether someone invented skateboards when I was a kid, or just "re-discovered" them, or just "unearthed" them makes ABSOLUTELY no difference, whatsoever, to the point. Whether you can list people who gave away free software or not, years ago, makes ABSOLUTELY no difference, whatsoever, to the point. Markets and tastes change. And businesses must change to keep up with the changing demands of their customers. Nobody in their right mind could argue that's not true. It IS generally true. So if DAZ bought software years ago, don't be surprised if market changes has forced them to do something different in the future. Is that really that difficult to understand? And no, I'm not attacking you, Kodiak3D, or anyone else. It is just so incredibly frustrating trying to have a rational discussion here. A little more advertising a development polish is all it needs. Good point. Piece of cake. Could some kind person do us a favor and fire up Google Maps or Google Earth and do a street view of the building and post it so we can see what the new place looks like? Yep - it's been one of Those Days. Maybe the Carrara devs get blotto on saki and nigiri after reading our rants? 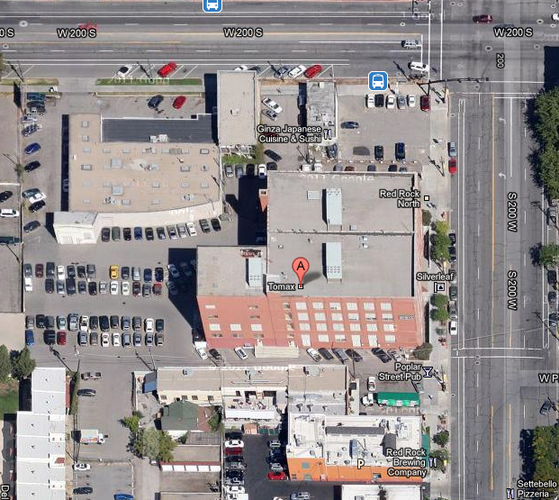 Lol, my first thought when I saw that pic was, "That looks like a render of Stonemason's Urban Sprawl 1." Put that one under "Signs you've been working with 3D software too long." Lol, my first thought when I saw that pic was, "That looks like a redner of Stonemason's Urban Sprawl 1." Garstor, you're to quick for me! There could be practical reasons they moved. Who's to say they owned the building in Draper? Maybe Salt Lake was more attractive to their talent base? Maybe available tax benefits to relocate? Personally, I'm not that worried about it. 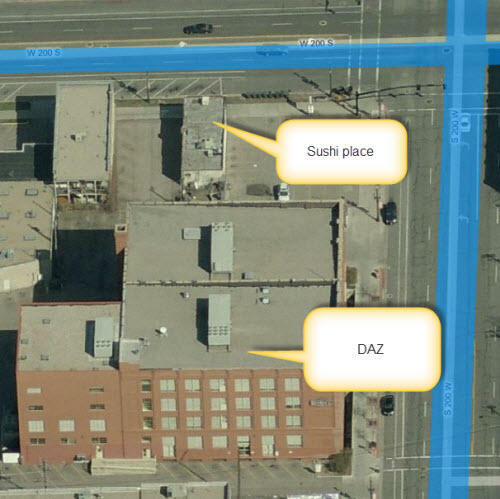 Excellent, thanks for posting the DAZ location photo. Now we can start the baseless speculation and random theories. So if they are on the second floor, I see 6 windows on that floor. And since the building is about as long as it is wide, let's say there are 6 windows on the other side. Which we could suppose means a total of something like 36 suites on that floor (6x6=36). And since the listed suite is "224" that means that it's a fairly reasonable assumption (224 = second floor, room 24). Now, according to the photo, the space defined by each window is a little larger than a standard parallel parking spot, which is about 9 feet. So let's call it 10 feet per window. So if each window was a suite, each suite would be 10 feet wide. So it's possible that 224 is one of 36 suites that are each only 10'x10'. But that's doubtful, since you have to allow for hallways and bathrooms and such. In any case, that would give a total floor square footage of 3600 sq. ft.
Now, maybe the main office suite (#224) is the mailing address, and they've also leased a bunch of other suites for the worker bees. That's possible. So either they have a single, 10'x10' office that fits maybe 2 people for the entire DAZ office, or they've leased the entire floor, or maybe even more. Or maybe they've contracted out much, or most, of their development to India or China or wherever and have only a skeleton crew in Salt Lake for doing the advertising and sales and finance and stuff. If someone is in the neighborhood, knock on the door and ask for a tour.